Using trading card pages and binders is one of the best ways to store and display your trading card collection. They provide easy access to your collection. You can also flip through a set or player collection and look at both sides of the card without excessive handling. The market is loaded with options for trading card pages. But which are the best? The first thing to consider is whether the pages are archive safe. Displaying cards this way is expensive when compared to basic cardboard boxes and most other forms of storage. The last thing you likely want to do is have to replace your trading card pages every couple of years because the pages you chose have oils that will hurt your cards over time. 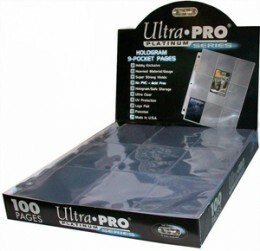 Both Ultra Pro and BCW, two of the most trusted names in trading card storage, make pages that are free of any potentially harmful acids or PVC. Although these pages cost a little more up front, you can be confident your cards are safe. The pages you find at your local dollar store are cheap for a reason. They're probably best avoided. Once you've found a safe line of trading card pages, the next step is to find the proper size. Although there is a standard card size, every year there are some exceptions that require special pages. Here's a breakdown of the most common sizes and configurations for trading card pages to help you pick the best ones for your collection. The standard for modern trading cards, 9-pocket pages are the most common in the hobby today. These pages are configured with three rows of three slots appropriate for 2.5" x 3.5 " cards. 1-pocket pages are great for displaying 8" x 10" photos. Over the years, cards have also ballooned to this size as well, such as 1997 Studio Baseball. A slight variation of single-pocket pages are made specifically for most magazines and programs. 2-pocket pages are ideal for cards, photos and other ephemera up to 5" x 7". These include somewhat recent Beehive Hockey sets released by Upper Deck and Pinnacle. Ideal for photos and other things measuring 4" x 6", 3-pocket pages are arranged with one horizontal pocket on top and two vertical slots below. Another configuration for 3-pocket pages is ideal for currency. Although most will think of traditional money, several trading card sets have had currency-themed inserts and test issues over the years. 1962 Topps Baseball Bucks and 1962 Topps Civil War News Currency come to mind. For those looking for dual-purposes out of their trading card pages, 3-pocket currency pages are also handy for storing coupons. The most common use for 4-pocket pages among collectors is with postcards. These pages are designed for products measuring 3.5" x 5". Slots are arranged vertically into two rows. One of the more common oddball card sizes is 2 1/2" x 5 1/2". Often called Tallboys, these dimensions were used on such sets as 1965 Topps Football and 1994 Fleer Extra Bases. Star Wars trading card collectors will need these pages to hold their Star Wars Widevision sets and singles. Until 1956, Topps Baseball cards were slightly bigger than they are today. They require 8-pocket pages, which are useful for cards measuring 2.25" x 3.5". They are arranged with four horizontal rows. Tobacco-sized cards have seen a resurgence in recent years thanks to various mini parallels in sets like Topps Allen & Ginter, Topps 206 and Upper Deck Goodwin Champions. Of course, there are also the original tobacco cards from a century ago. Fifteen-pocket pages have three rows of five slots. They are intended for cards measuring 1 1/2" x 2 1/2". Raise your hand if you still have the odd pog or two kicking around from the early-90s? I thought so. Several sets, like the Pinnacle Mint line, have come with coins. Enter the 20-pocket page. These have slots ideal for coins, pogs, slides and other small items measuring up to 2" x 2".